Identification. Brunei Darussalam is a multiethnic society in which one ethnic group, the Barunay, has a monopoly of political power. Variations in tradition among other ethnic groups are not regional but cultural, social, and linguistic. Indigenous Muslims usually are referred to as Brunei Malays even if they are not native speakers of the Malay language. Speculations about the etymology include derivations from the Malay ( baru nah ("there! 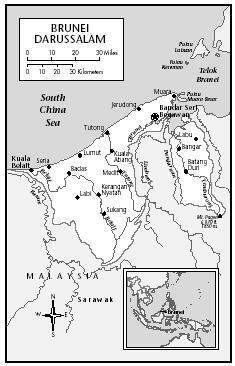 "), a Sanskrit form, and the Kelabit name for the Limbang River. Location and Geography. The original home of Brunei culture is the area around the capital, Bandar Seri Begawan. Settlements of Barunay and Kadayan also are found along the coasts of northern Sarawak and southwestern Sabah in Malaysia; Tutong and Belait settlements are found exclusively in Brunei. Bisaya, Iban, and Penan people also live in Sarawak and Dusun and Murut people in both Sarawak and Sabah. Brunei Darussalam is 2,226 square miles (5,763 square kilometers), with a coastline of about 100 miles (161 kilometers) on the South China Sea coast of northwestern Borneo and along the western shores of the southernmost portion of Brunei Bay. Brunei is completely surrounded by the Malaysian state of Sarawak. The climate is equatorial with high temperatures, high humidity, and heavy rainfall, although there is no distinct wet season. The country is divided into three contiguous administrative districts—Brunei-Muara, Tutong, and Belait—with a fourth, Temburong, separated by the Limbang Valley of Sarawak. The names of the districts derive from their main rivers. Approximately 75 percent of the country is forested, although the exportation of whole logs has been banned. The country is covered with a wide range of mangrove, heath, peat swamp, mixed dipterocarp, and montane forests. There are numerous rivers, whose broad valleys contain most of the country's settlements. The southern portion of Temburong is mountainous and sparsely populated. Demography. The 1998 population estimate was 323,600. Malays constitute about 67 percent of the total; Chinese, 15 percent; other indigenous peoples (Iban, Dayak, and Kelabit, all mainly from Sarawak), 6 percent, and others, 12 percent. In the late 1980s, 24,500 immigrants worked primarily in the petroleum industry. The population has increased more than twelve-fold since the first decade of the twentieth century. The distribution of population is Brunei-Muara, 66 percent; Belait, 20 percent; Tutong, 11 percent; and Temburong, 3 percent. Linguistic Affiliation. Malay is the official language, but English is widely used in commerce. The Brunei dialect of Malay has many unique lexical items and a distinctive syntax. Malay is in the Western Malayo-Polynesian subgroup of the Austronesian language family, which also includes the other languages spoken in Brunei. Various Chinese languages, English, and Philippine and mainland south Asian languages are spoken by guest workers. Many individuals are multilingual. red, which was added in 1959. The crest is composed of a flag and royal umbrella; four feathers symbolizing the protection of justice, tranquillity, prosperity, and peace; two hands representing the government's pledge to promote welfare, peace, and prosperity; and a crescent symbolizing Islam and inscribed in Arabic "Always in service with God's guidance"; with a scroll inscribed in Arabic letters, Brunei Darussalam ("Brunei the Abode of Peace"). Emergence of the Nation. The origins of the nation are only dimly known. Local traditions speak of a set of ancient local Bornean culture heroes, including Hawang Halak Batatar, who adopted Islam and became the first Muslim sultan of Brunei, Sultan Muhammad (reigned 1405–1415), and his brother, Patih Barbai, who became the second sultan, Sultan Ahmad (reigned 1415–1425). These heroes gave rise to the Barunay nobles. Many Barunay aristocrats trace their origins to the Pagar Uyung area of the Minangakabau highlands of Sumatra. The third sultan, Sharif Ali (reigned 1425–1433), who married a daughter of Sultan Ahmad, came from Arabia and was a descendant of the Prophet Muhammad, as were all the following sultans. Chinese documents record the ruler of Brunei sending a mission to the emperor of China in 977 C.E. The Brunei Empire, stretching to Manila and the southern Philippines and the coastal areas of western and northern Borneo, reached its height in the sixteenth century; the nadir occurred in the nineteenth century. Two ultimately unsuccessful Spanish invasions from Manila occurred in 1578 and 1580. A twelve-year civil war occurred in 1661–1673. Brunei became a British protected state in 1888 and became internally self-governing after the promulgation of the constitution in 1959. After achieving full independent sovereignty in 1984, Brunei joined the Association of Southeast Asian Nations (ASEAN), the Organization of Islamic Conference, and the United Nations. In 1992, Brunei joined the Nonaligned Movements. National Identity. In 1990, a new state ideology was launched to promote the unity of the diverse groups within a plural society. Malayu Islam Beraja (MIB, or Malay Muslim Monarchy) is based on the idea of Brunei as a traditional Malay state, a long-established Islamic state, and a monarchy. Ethnic Relations. All the ethnic groups in the nation have always been under the authority and rule of the sultan. More than half the population lives in and around the capital. Other major towns include Tutong Town, seat of Tutong District; Kuala Belait, seat of Belait District; the small town of Bangar, seat of Temburong District; the deep-water port Muara, which opened in 1973 in Brunei-Muara District; and Seria, the center of the petroleum industry, in Belait District. There are also suburban developments around the capital and rural villages. The past two decades have seen a tremendous buildup around the capital. 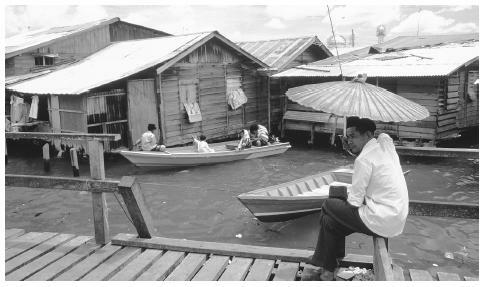 A network of roads and highways connects settlements in the three contiguous districts; Temburong is reached by boat from the capital area. The architecture of the capital and its environs is dominated by the gold-domed Omar Ali Saifuddien Mosque (completed in 1958); the Nurul Iman Palace (1983), the largest residential palace in the world; the Royal Regalia Building (1992); the Royal Audience Hall (1968); and the Legislative Assembly (1968). The Tomb of the Fifth sultan is two miles downstream from the capital. The Royal Mausoleum has been used since 1786. The Hassanal Bolkiah National Stadium is the site of many large public celebrations. Numerous parks and recreation centers have been developed in the last decade. Food in Daily Life. The diet consists of rice and curries of vegetables, fish, shellfish, and fruits. Curries of water buffalo, chicken, and beef are consumed on special occasions. Game birds and animals (especially mouse deer, barking deer, and sambar) are eaten in rural areas. Many kinds of Malay rice cakes and confections are also eaten. Pork products are forbidden to Muslims. There is a wide range of open-air markets and restaurants in the main towns. A popular local drink is iced unripe coconut milk. Coffee is widely consumed; alcoholic drinks are forbidden to Muslims. Food Customs at Ceremonial Occasions. At large Malay wedding feasts and the forty-day funeral feast, rice and coconut cream-based meat curries ( santan ) are served, often to a hundred or more guests. Basic Economy. Since World War II, the state's economy has been based on the exportation of petroleum and liquified natural gas (LNG), which account for about 36 percent of the gross domestic product (GDP). Brunei is the third largest oil producer in southeast Asia and the fourth largest producer of LNG in the world, exporting mainly to Japan, the United States, and ASEAN countries. Brunei produces only about 1 percent of its domestic needs for rice, 11 percent for fruit, 65 percent for vegetables, and some livestock (cattle and water buffalo). In early 1998, approximately 36,345 wage earners worked for the government and 106,000 were in the private sector. In rural areas an unknown number are still primarily subsistence producers. There are no sales, personal income, or capital gains taxes, only a 30 percent tax on corporate income. The workweek is Monday through Thursday and Saturday, with Friday and Sunday off. The national currency is known as the Bruneian dollar. Land Tenure and Property. Before the land code of 1909, all land was either Crown Land, appanage land (held by high ranking nobles who were awarded "sacred" titles by the sultan), or private-heirloom land (held primarily by high-ranking nobles). Today any land not under private title is state land. Only citizens are allowed to own land. Rural villages have rights to state land for agricultural use. Commercial Activities. Commerce is in its infancy. Local industry includes a water-bottling plant, a soft drink franchise, and garment companies. Foreign investment is encouraged but not highly developed. Priority is given to ensuring the stability of the natural environment, and all polluting industries are banned. Forest products and deep-sea fishing are not open to foreign investment. An international airport opened in 1974, and Royal Brunei Airlines began operation in 1975. Major Industries. Commercial production of oil from land wells began in 1929. In 1963, production from offshore wells began. A major LNG production facility was completed in 1972. Trade. The Bruneian economy is largely supported by exports of crude oil and natural gas, with revenues from the petroleum sector accounting for more than 50 percent of GDP. A 1990 study estimated that the commodities exported totaled approximately $2.2 billion, with the main exports including crude oil, liquid natural gas and petroleum. Brunei's main trading partners include Japan, the United Kingdom, and South Korea. The same 1990 study accounted for $1.7 billion in imported commodities. Brunei imports such goods as machinery and transport equipment, food, and manufactured goods. Singapore, the United Kingdom, and Switzerland are established as Brunei's main resources for these imported goods. Classes and Castes. The dominant ethnic group, the Barunay, is composed of four ranked ascribed social classes: the nobles, the aristocrats, the ordinary people, and the slaves, although slavery is no longer practiced. Because class membership is strictly genealogical, a person assumes the class membership of his or her father and cannot rise or fall into any other class. There are no castes. The Kadayan have no social classes. Symbols of Social Stratification. The only outward signs of social stratification are the prename titles of respect used in addressing or referring to nobles. Houses in the settlement are accessed by boats which travel on the waterways and canals within the community. Government. Brunei Darussalam is an absolute constitutional monarchy. There are no political parties, elections, or legislature. Attempts to establish political parties in 1956 and 1985 did not succeed. In 1996, the first General Assembly of over a thousand elected village and mukim leaders met to give input to the Government. The first written constitution was promulgated in 1959, naming the sultan head of state, assisted by five councils (Religious Council, Privy Council, Council of Ministers, Legislative Council, and Council of Succession), with internal self-government and defense and foreign relations run by the United Kingdom. It was amended in 1971 to establish joint Bruneian-British responsibility for defense; in 1984, a cabinet-style government was introduced when Brunei resumed full sovereignty. The sultan appoints judges to the Supreme Court, which consists of the high court and the court of appeals, and the Subordinate Court, which consists of the magistrate's courts. In 1991, an intermediate court was given civil and criminal jurisdiction. Syariah courts deal with Islamic law. Leadership and Political Officials. There are two forms of government administration—a modern administrative bureaucracy and a traditional system of ritual offices—which are awarded to nobles and aristocrats by the sultan. Individuals can rise through the ranks in both systems. The traditional system includes for the nobles five offices of vizier and about sixty additional various offices, and for the aristocrats about seventy-three offices of minister ( Pehin ). All occupants are males. Not all these traditional offices are always occupied at any given time; offices are not inherited on the death of their occupants but remain vacant until a sultan appoints a new occupant. Social Problems and Control. While the incidence of child abuse appears to be low, it is punished severely. Spouse abuse can be a cause for divorce. In general, Brunei is crime-free, especially in terms of violent crime. Military Activity. The Royal Brunei Armed Forces (RBAF) was founded in 1961. The RBAF was restructured in 1991 into land forces, an air force, a navy, support services, and a training corps. Service in the RBAF is voluntary. The main purpose of the military forces is defense. Since 1955, citizens, permanent residents, and persons who have worked in Brunei for thirty years have been entitled to a monthly pension. Elderly persons with dependents below working age receive additional allowances. Muslims in Brunei may not belong to international service organizations. Division of Labor by Gender. Women have begun to assume positions of responsibility in government offices and departments. While women can be in the armed forces, they may not serve in combat. The Relative Status of Women and Men. Compared to Islamic societies in the Middle East, women have very high status. Muslim women are encouraged to wear the tudong , a traditional head covering. Marriage. Usually the parents of a young man arrange a marriage with the parents of a young woman. For a Muslim, the spouse must also be Muslim; thus, individuals, especially men, often convert to Islam in order to marry a Muslim. Interethnic group marriages are not uncommon. There is considerable minor variation in marriage ceremonies from group to group and within ethnic groups. Domestic Unit. The domestic unit may be either a nuclear family or an extended family. This domestic arrangement is generated by a tradition in which a newly married couple joins the household of the bride's parents. After some time, young married couples may establish their own independent household. Inheritance. Islamic inheritance law applies to Muslims. For non-Muslims, traditional practices apply. Kin Groups. There are no descent-based kin groups. Malay kinship terminology is generational, with all "aunts" and "uncles" referred to as "mother" and "father," and Hawaiian, with all "cousins" referred to as "siblings." The kinship network of relatives may be very wide in the case of the Kadayan, who treat a relative by marriage the same as a blood relative, or narrower, in the case of the Barunay. Infant Care. Infants are watched over constantly by their parents, who often take them to the tasks in which they are engaged. Babies are fondly loved and appreciated by all. Child Rearing and Education. Parents give young children responsibility for the care of their infant siblings at an early age, especially in rural areas. Higher Education. The Universiti Brunei Darussalam opened in 1985 and offers a number of undergraduate degree programs, a few master's degrees, and a few certificate programs. Approximately two thousands government scholarship students study abroad, mainly in Commonwealth countries. The following rules of etiquette are universal: pass items only with the right hand; refuse food by touching the container with the right hand, never verbally; use a thumb, never an index finger, to point; remove shoes whenever entering a home or public building, especially a mosque; shake hands gently and then gently touch the center of one's chest with the right hand afterward; never address a person by name alone; never consume items until specifically requested to do so; avoid public intersexual bodily contact; and never lose one's temper. Religious Beliefs. The national religion is the Shafeite sect of Islam. Religious holidays have variable dates that are set according to a lunar calendar. Early Ramadhan marks the beginning of the holy fasting month; the Anniversary of the Al-Quran commemorates the revelation of the Holy Book of Islam; Hari Raya Adilfitri or Hari Raya Puasa celebrates the end of the fasting month; Hari Raya Aidiladha or Hari Raya Haji celebrates the Haj or holy pilgrimage to Mecca; Hijrah celebrates the journey of the Prophet Muhammad Sallallahu Alihi Wassalam from Mecca to Medina; Mulaud, or the Birthday of the Prophet Muhammad, celebrates the birth of the founder of Islam; and Israk Mikraj commemorates the ascendancy of Muhammad into heaven. 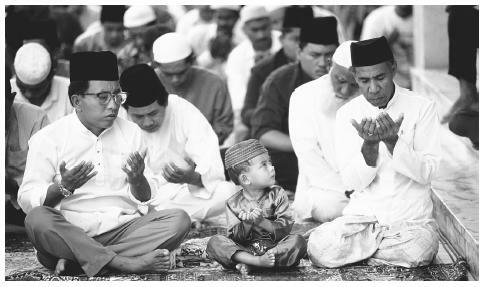 A young boy watches the adults as they perform the noon prayer at a mosque in Bandar Seri, Begawan. The Shafeite sect of Islam is the national religion. divorce, and the family as well as some sexual crimes are governed by Islamic law and fall under the jurisdiction of the religious court system. Rituals and Holy Places. Sixty mosques are maintained by the Ministry of Religious Affairs. Tombs of sultans are often treated as shrines. Government health services are free for citizens, with minimal charges for permanent residents and immigrant government employees and their dependents. There are government hospitals in each of the four districts and two private hospitals, with the main referral hospital in the capital. Rural villages are served by scheduled Flying Medical Services by helicopter. Citizens are often sent abroad for treatment at government expense. The national secular holidays are New Year's Day, 1 January; National Day, celebrating Brunei's resumption of full independent sovereignty in 1984, 23 February; Royal Brunei Armed Forces Day, marking the foundation day of the RBAF in 1961, 31 May; the Birthday of His Majesty the Sultan Haji Hassanal Bolkiah the Yang Dipertuan of Brunei Darussalam, 15 July; Christmas, 25 December; and Chinese New Year's Day, whose date is fixed by a lunar calendar. Support for the Arts. History and local crafts are supported by a number of public institutions, including the Royal Regalia Building (1992), the Brunei History Center (1982) and the associated Churchill Memorial Museum, the Brunei Museum (1972), the Malay Technology Museum (1988), the Arts and Handicraft Center, and the Constitutional Museum. 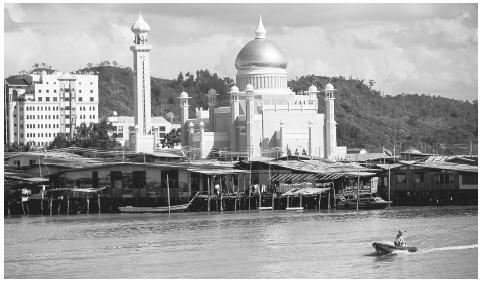 The Omar Ali Saifuddin Mosque on the Brunei River in Bandar Seri Begawan. Brunei is a constitutional monarchy; the Sultan is the head of state and all other political offices are held by men. Simawn and constitutes a traditional history of the sultanate. Graphic Arts. Traditional arts and crafts form a large segment of Brunei's cultural heritage. Boat making, silver-smithing, bronze tooling, cloth weaving and basket making are examples of the types of artistry celebrated and emulated in modern-day culture. The Hassanal Bolkiah Aquarium is in the capital. The Kuala Belalong Field Studies Center, set up in 1991 under the joint sponsorship of the University Brunei Darussalam's Department of Biology and the Brunei Shell Petroleum Company, is located in the Temburong District. A department of sociology and anthropology was opened at the University Brunei Darussalam in 1997. Brown, Donald E. Brunei: The Structure and History of a Bornean Malay Sultanate, 1970. ——. Principles of Social Structure: Southeast Asia, 1976. Brunei Shell Group of Companies, Brunei Darussalam: A Guide, 1992. Cleary, Mark, and Hairuni H. M. Ali Maricar. "Aging, Islam and the Provision of Services for Elderly People in Brunei Darussalam. David R. Phillips, ed., in Aging in East and South-East Asia, 1992. Government of Brunei. Brunei Darussalam in Profile, 1988. Hussainmiya, B. A. Sultan Omar Ali Saifuddin III and Britain: The Making of Brunei Darussalam, 1995. Leake, David, Jr. Brunei, The Modern Southeast-Asian Sultanate, 1989. Maxwell, Allen R. "Kadayan Men and Women." In Vinson H. Sutlive, Jr., ed., Female and Male in Borneo: Contributions and Challenges to Gender Studies, 1991. ——. "Who is Awang Simawn?" In Victor T. King and A. V. M. Horton, eds., From Buckfast to Borneo: Essays Presented to Father Robert Nicholl on the 85th Anniversary of His Birth, 27 March 1995, 1995. ——. "The Place of the Kadayan in Traditional Brunei Society." South East Asia Research 4 (2): 157–196,1996. ——. "The Origin of the Brunei Kadayan in Ethno-historic Perspective." In Robert L. Winzeler, ed., Indigenous Peoples and the State: Politics, Land, and Ethnicity in the Malayan Peninsula and Borneo, 1997. Ranjit Singh, D. S. Brunei 1839–1983: The Problems of Political Survival, 1984. Saunders, Graham A History of Brunei, 1994. This is a good site. although they should put in what percentage of the jobs the people of Brunei have. This was very helpful information. it covers many topics about the culture of Brunie. Great for assignment help. VERY INFORMATIVE ARTICLE, IF IT DOESN'T TROUBLE YOU, I WANT TO KNOW MORE ABOUT 'Barunay and Kadayan' ..THANK YOU. AND I'M SORRY IF YOU CAN'T UNDERSTAND MY ENGLISH . :-) HAVE A NICE DAY . Wonderful article that I will share with my class. This is comprehensive, almost everthing that i want to know about Brunei are written here. Thank you so much for posting! it was a very helpful information. a really big help to my project. All that has been given above is very helpful.What I need to ask is about the scope of Life Insurance jobs there in Brunei. 2nd is about the Brunei cruncy. I come across this article searching on a certain family group in Brunei hoping to learn more of their history. Though information here is general, i found out that there still more to learn Brunei culture. Am glad i was able to start reading the article which is very informative. But i still keep on researching the Brunei family way. Thank you for this kind of article. i just i want to know how western countries influenced the educational system in Brunei? Love u BRUNEI. Brunei-Heaven on Earth. I want to live rest of my life in Brunei. Pls guide me how to get PR of Brunei.